Designed by parents and powered by advanced machine learning, Bark is an affordable, easy-to-use app created to monitor a child’s online behavior while still affording them some degree of privacy. Launched in 2015, the simple-to-use app offers parents tools to keep up with the ever-changing virtual landscape kids are developing in. It analyzes every text message and post for bullying, substance misuse, suicidal ideas, depression, sexting, and more. When the software identifies a potential issue, it alerts you so you can view the flagged text, email, post, or picture. 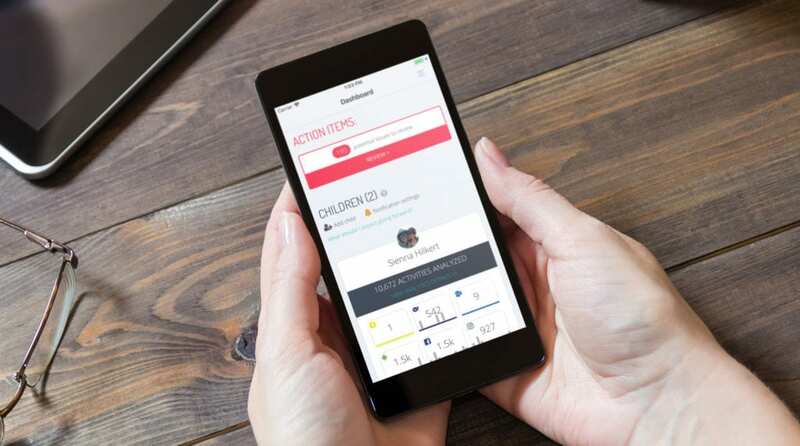 Along with each alert, Bark sends suggestions on how you can engage with your child in productive, meaningful ways based on the type of behavior that was flagged. This Bark app review is based on testing on the part of our staff, as well as research on the company and its reviews. Read more about our methodology for further details about how we rank and review products. Once you download the app and set up an account, you’ll begin the process of linking your kid to your account. To do this, you input your child’s name and birth year, at which point they’ll appear on the app’s dashboard. In order to allow Bark to start monitoring their phone, either you or your child has to input their username and password for each social media account. Each time an account is linked, it will appear on your dashboard. When the app detects a potential issue, it immediately responds by sending you an email and a notification on your cellphone. From there, you can view the message or image deemed potentially problematic along with the date and time it occurred and what category of behavior it falls under—be it cyberbullying, profanity, sexually explicit content, depression, and more. Bark’s greatest strength is the robust software it employs for anywhere from one half to one quarter the cost of many of its competitors. All in all, the app monitors 24 social networks and apps. According to Bark’s site, this is four times more than any other parental control phone tracker. Bark doesn’t wait for conversations to veer into suicidal territory before it begins warning parents. Even something as simple as a text message to a friend saying, “I’m having a hard time getting up in the morning,” is enough for Bark to alert a guardian of potential signs of depression. Given Bark’s sophistication, $9 a month feels very much like a bargain—especially considering that there are no limits on the number of kids or activities that can be monitored. Carried out exclusively via chat and email, Bark’s customer service is helpful and friendly, and it does a good job responding within a day. Even those interested in the free trial alone are required to enter their credit card info. And while the app keeps a tracker on your dashboard ticking down the days before it expires, it’s not clear how to cancel or if you’ll be automatically charged or allowed to opt out once it hits zero. Available on Android, iPhone, and desktop computer, Bark is designed with the tech-adverse in mind. Whether accessed via a mobile device or desktop computer, Bark’s user experience is intuitive and uncluttered. So your teen is sexting with a peer. What do you do? Bark knows these conversations can be difficult to approach, which is why every flagged activity is accompanied by “recommended actions” based on expert advice. The app also provides parents with a list of related resources specific to the flagged activity. Admittedly, it can have a “big brother” feel when a text or picture your child never planned on you seeing appears on your own cellphone. This is especially true in the beginning as both parties become familiar with the kind of content that the app flags. That said, it is far less intrusive than having your child hand over their phone and reviewing all their activity—not simply those deemed potentially problematic. Unlike many other parental control apps, Bark does not allow parents to set any kind of time limits on phone use. Q: Does the price increase if I want to monitor more than one child? A: Nope, that is a flat fee. Q: Does the app work if I have an iPhone and my teen has an Android, or vice versa? Q: Does the app monitor Instagram direct messages? A: Only if your teen uses an Android or Amazon device. The same is true for Snapchat and Musically. Q: Does it monitor Reddit? A: Yes, including your child’s submissions, comments, and private messages. A: Bark monitors any videos your child posts and those posted by others to your child’s users and channel subscriptions. In the case of Android and Amazon devices, it can monitor what your child watches on YouTube as well. Q: What if my child opens new social media accounts under different names? A: Bark can detect new app installations in accounts and use over time. Q: Does Bark work in languages other than English? A: No, though the team is working to change that.